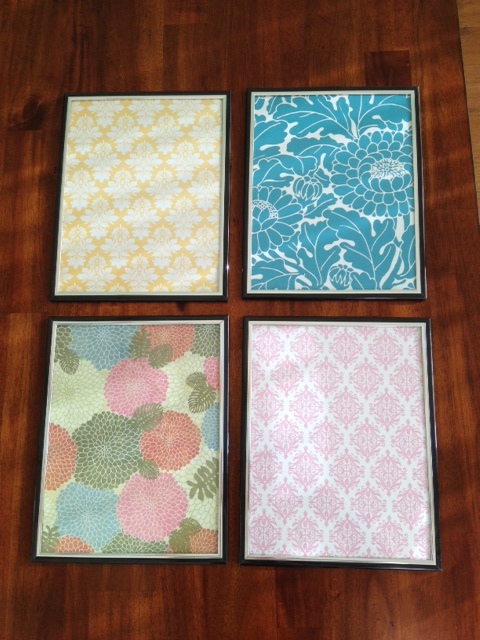 Each of those 81/2×11″ frames were 25 cents and the scrapbook paper was 99cents a sheet! 2. Last night’s dinner was FANTASTIC. I took the recipe from SkinnyTaste, and only tweaked it a bit. <—because I am terrible at converting ounces to grams and then usually halving the recipe for just the two of us. Yes, pretty much everything here is in grams which drives me freaking batty. 2. Cook the noodles until they are almost al dente. Strain and set aside. 3. Preheat oven to 375, spray 8×8 with cooking spray. 4. Put the oil in a skillet over medium heat. Add the garlic and allow it to simmer for about a minute. Then add the broccoli florets. Turn the heat to low and cover the skillet to allow the broccoli to steam. 5. In a large pot, add the butter. Once it’s melted, throw in the onion and allow the onion to soften for a few minutes. Add the flour until incorporated. Then add the chicken broth and whisk thoroughly. Add the milk and bring the mixture to a boil (stirring occasionally). Once brought to a boil, turn it back down to medium heat and allow 6-7 minutes for mixture to thicken. Remove from heat, and add the cheddar cheese and 1 tbsp parmesan. Mix well. 6. 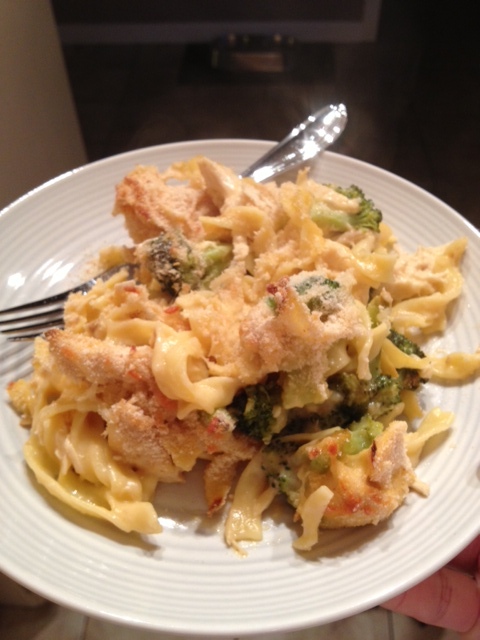 Add shredded chicken, noodles, and broccoli to the cream mixture in pot. 7. Pour the mixture into the 8×8 dish. 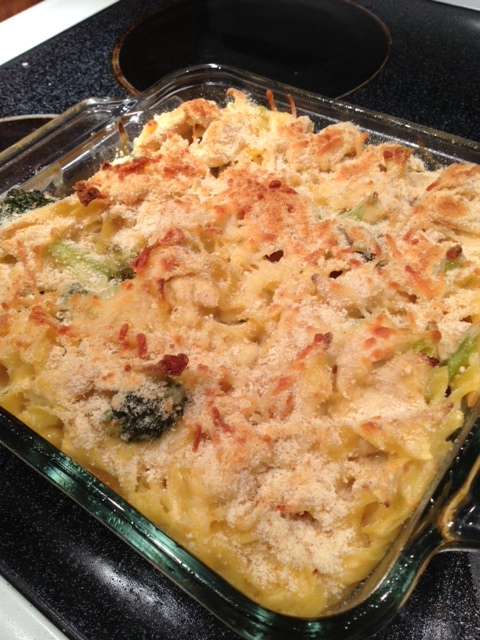 Top with remaining 2 tbsp parmesan cheese and bread crumbs. 8. Bake for 20 minutes, then allow it to sit under the broil for a couple minutes to allow the top to brown. 3. 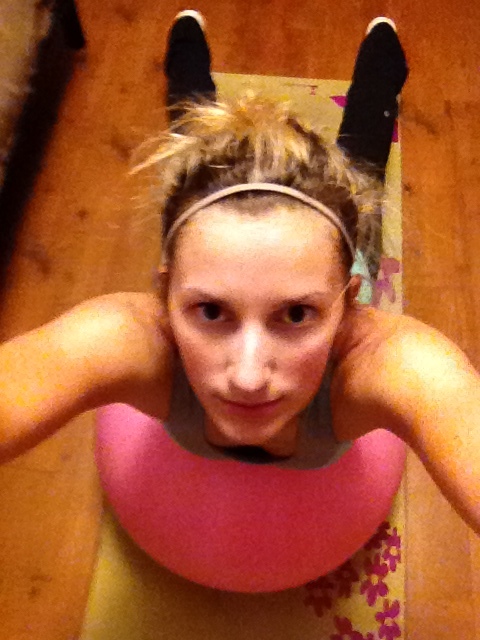 I worked out at home yesterday and did the strength workout B from Best Body Bootcamp. It was an interesting workout, and I adjusted a few moves to accommodate the equipment I have. The toughest one was what I substituted for hamstring curls- I actually used my gliding discs for these. Yikes, my hammies were screaming after that set. There were cardio intervals within the supersets and I finished it off with some kickboxing. Check out this super flattering picture. 4. It was during my workout (in ‘my’ room) that I noticed it’s been a while since I updated my calendar. Just a few months off. No biggie. 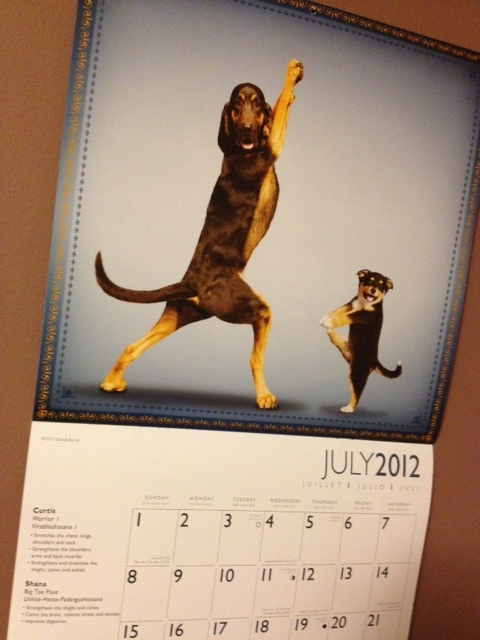 But July is my favorite. 4th of July, my birthday, summer= all happy things. 5. A lot of people do throwback thursday pics. Since I am now 3000 miles from home, I couldn’t really bring any of my stuff with me, so I don’t really have any of my childhood pictures. But I do have this gem that my mom somehow brought this summer. 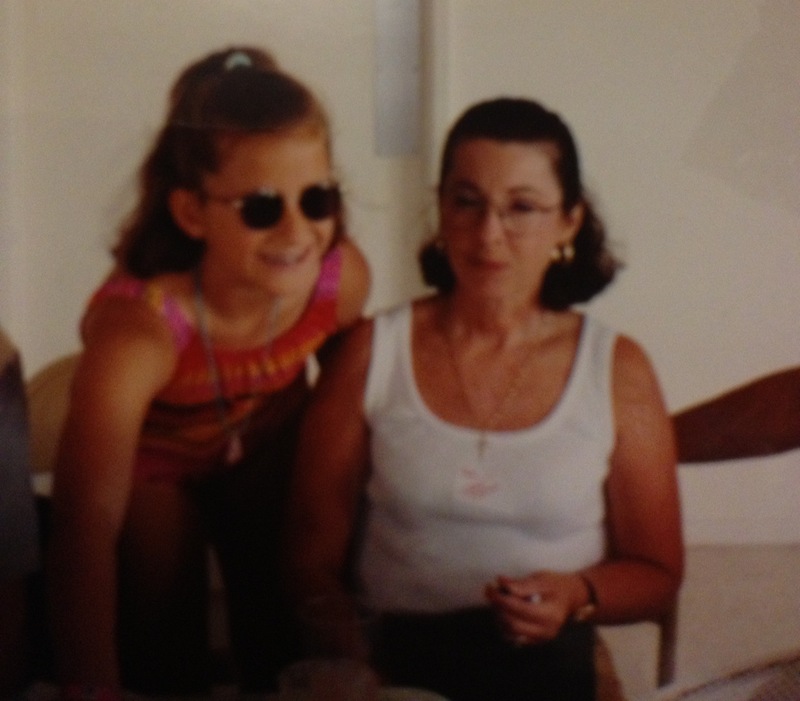 It was my understanding that in 5th grade, prescription sunglasses were HOT. Looking at it now: NO THEY’RE NOT. 6. I got shout outs on both Leigh AND Alison’s blogs today (ladies, I am totally stealing that post soon!) Woo hoo! What song (new or old) do you have on heavy rotation lately? I will totally try this recipe. Yum. Your DIY is very cute!! Nice work Martha. 1) I bought and put together all the ingredients for that crock pot chicken chili last night and forgot to set it in the crock this morning. Doh! 2) I went to a wedding this weekend and was randomly wondering if any brides ever work out the morning of their wedding. I figure if anyone does this, it will be you! 2.) I am already commissioning Athena to run a bootcamp for us the morning of! hahah. no, seriously. I have no idea- maybe over the dresser in our bedroom? I’ll make sure to link up!! That casserole looks SOOOO good!!! And that craft project is genius.